The next morning, we went back to Kwai Lock for breakfast. This time, we ordered the ark thooi mee sua (duck mee sua), sar hor fun and duck egg char kway teow (again). The mee sua was quite good. The soup was savoury and slightly peppery with a strong dose of herbal goodness. The duck meat was very tender and mee sua was firm to the bite. 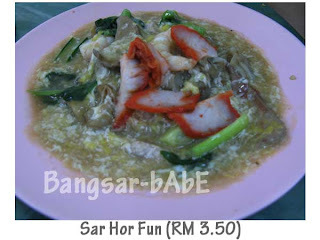 The sar hor fun was nice, better than the one we had for dinner at the Pulau Tikus market. The silky rice sheet noodles were fragrant and topped with eggy gravy, prawns, pork, sweet char siu and vegetables. 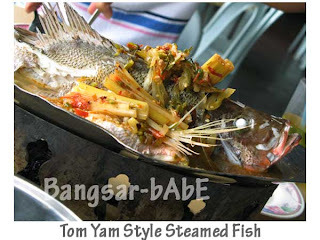 My only gripe was the small portion – then again, I noticed that the food portions in Penang tend to be very small. We also bought a packet of fried carrot cake to try. Didn’t eat it right away, as we were quite full from breakfast. The carrot cake was quite good. With a good dose of wok hei, the carrot cake came laden with beansprouts, chives and eggs. Worth a try. rif however thought it was average. He still prefers the Malacca version. 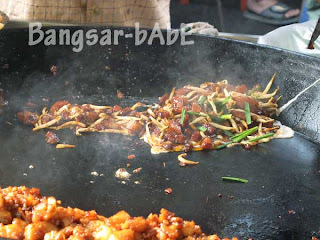 (Bangsar-bAbE: Biased…..) After checking out, we met up with rif’s colleague (Tiang) at Bukit Tambun for lunch at 1.30pm. 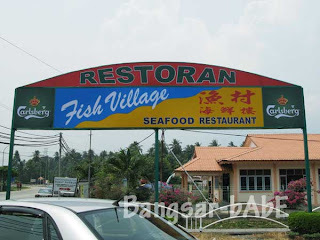 Tiang took us to Fish Village Seafood Restaurant. 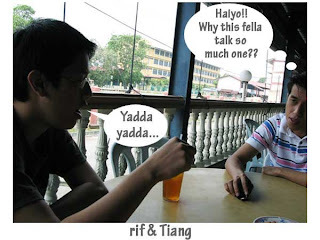 Since he’s from Penang and knows better about the place, he did the ordering. We had fried sotong, kang kung belacan, steamed lai liu har (mantis prawn) in rice wine and egg whites, stir-fried lala with ginger and spring onions, steamed fish and stuffed yau char kwai. While waiting for the food, the boys chatted while I took randoms shots of them. 😛 The sotong was of the crunchy sort and fried with sweet chilli sauce. I didn’t like it as I’m accustomed to the soft and tastily chewy fried sotong. 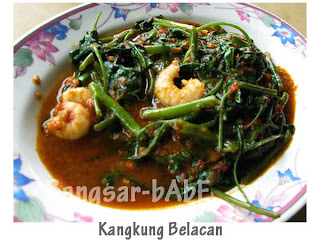 The kang kung belacan was pretty decent. The belacan was fragrant and had a good ‘kick’. Very nice with rice. 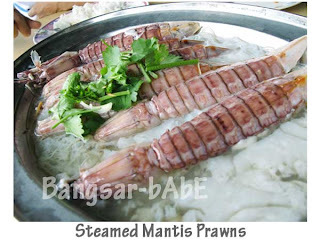 The mantis prawn (lai liu har) was very fresh, sweet and firm to the bite. Steamed with ginger, rice wine and egg whites, it was delicious with the clear yet fragrant gravy. I enjoyed the lala immensely. I think I ate 70% of it, since it was on my side of the table. However, I thought the lala was a tad small. It would have been even nicer fat and juicy. I’m generally not a fan of fish, but the steamed fish was quite good and fresh too. The gravy was spicy and tangy with loads of chopped birds eye chilli and tomatoes. The stuffed yau char kwai came last, and hit homerun with rif and I. The crunchy rice crullers were stuffed with fish paste and deep-fried till golden brown. Topped with generous lashings of mayonnaise, I simply have to have this again! Don’t know how much each dish cost as I misplaced the bill already, but lunch came up to RM72 for the 3 of us including drinks. Thanks for lunch Tiang!